A Lot of Souls Donate Shoes for Great Cause! 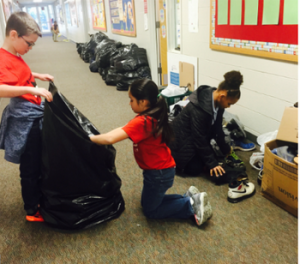 The Abraham Lincoln Elementary Service club collected 918 pairs of shoes during the month of January. The used shoes were donated to Waterstep, an organization that turns used shoes into clean water for underdeveloped countries, and countries hit with of disaster. We want to thank the staff at Perry Township Education Center, the Perry Transportation department and Mrs. Ponchot’s class at Rosa Park’s Elementary for joining our plight. Working as a team Perry Township students and staff are making a real difference in the world. Because of this many families will have access to clean water, learn job skills and be able to purchase their first pair of shoes. We greatly appreciate the support Perry Township poured into the ALE service club efforts. We are proud to be Lincoln!